Natural Blue Topaz: It is very rare to find topaz with a blue color which was created by nature. This specimen is from Zimbabwe and measures 4.6 x 4.2 x 3.1 centimeters. Specimen and photo by Arkenstone / www.iRocks.com. Blue is the most popular topaz color in today’s jewelry marketplace. It is sold in a broad range of blue colors, starting from a pale blue with a light tone and saturation, all the way to a deep blue with a moderate to dark tone and saturation. Blue topaz is very attractive, inexpensive, and a favorite color of the jewelry customer. These characteristics drive the popularity of blue topaz. Before 1970 most of the topaz in low to moderate price jewelry was yellow to brown in color. Natural topaz with an attractive blue color was rare and very expensive. As a result it was seldom seen in jewelry. Today's blue topaz is a product of gem treatment. Stream-Rounded Topaz that might be successfully heat-treated to produce blue topaz. These topaz pebbles range from about 1/2 inch to 1 inch (12 to 25 centimeters) across. In the early 1970s, gem treatment experiments revealed that much of the abundant and inexpensive colorless topaz could be converted into blue topaz. 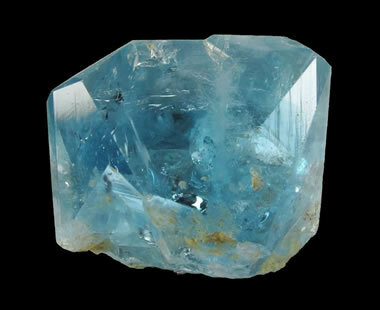 The colorless topaz was first treated with high-energy electron or gamma radiation and then heated to a beautiful blue color. Treaters learned to vary the treatment procedure to yield topaz in a wide range of blue colors. The radiation used to treat topaz consists of a beam of subatomic particles. These tiny particles enter the topaz crystal at high velocity and have the ability to knock electrons out of their orbits or cause other damage to the crystal lattice. These defects change the way that light travels through the crystal and can change the wavelengths of light that are absorbed. The result can be a change in the color of the topaz as perceived by the human eye. 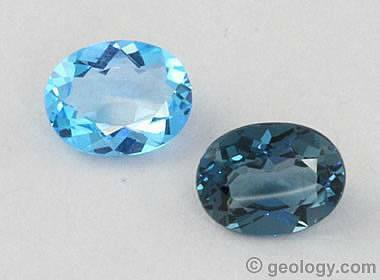 Faceted Blue Topaz: Two faceted ovals of blue topaz, with a blue color produced by irradiating and then heating colorless topaz. The gem on the left is an example of "Swiss Blue" topaz. It weighs approximately 2.02 carats. The gem on the right is a "London Blue" topaz weighing 2.26 carats. Two varieties of treated blue topaz have become dominant. These are known as “Swiss Blue” and “London Blue” topaz. Swiss Blue is a bright blue topaz with a light tone and light to moderate saturation. London Blue is a dark blue topaz with a moderate to dark tone and saturation. These two colors give jewelry buyers a choice of two blue colors. London Blue is the current market favorite. It is only slightly more expensive than Swiss Blue topaz. 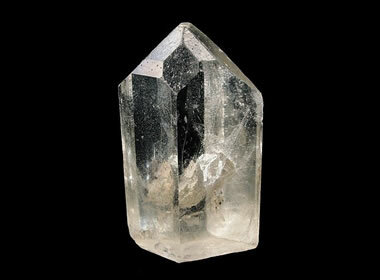 Colorless Topaz Crystal: This crystal is from the Mimoso do Sul Mine in Brazil. It weighs 285 grams and measures 9.1 x 5.4 x 3.3 centimeters. Specimen and photo by Arkenstone / www.iRocks.com. A manufacturer preparing to supply a large retail chain often has difficulty finding an adequate supply of gemstones. The company needs thousands of gems with a consistent color, clarity, cut and size. This will be a huge faceting job, but it can also be a huge sorting job if the gemstones vary in color. Colorless topaz is the perfect material for faceting gems of consistent color and clarity. It is abundant, available in large high-clarity crystals, and can be treated to a consistent blue color. Is Treated Blue Topaz Safe? Many people have concerns about the safety of blue topaz because it has been treated with radiation. All companies in the United States who treat gemstones with radiation must be licensed by the Nuclear Regulatory Commission (NRC). The NRC requires all irradiated gemstones to be stored in a secure facility after treatment. While in storage, the gemstones must be monitored until their residual radiation declines to a level that they are safe for use in jewelry. This procedure assures the safety of blue topaz treated within the United States. The radiation and heat treatment used to produce the blue color in topaz is permanent, so there is no worry about the gems fading with exposure to light. However, topaz has one direction of perfect cleavage that might separate if it is exposed to rough handling. It can also contain liquid-filled inclusions that can cause a gem to fracture when heated. So, topaz should be cleaned carefully with warm soap and water. Steam and ultrasonic cleaning should not be used.